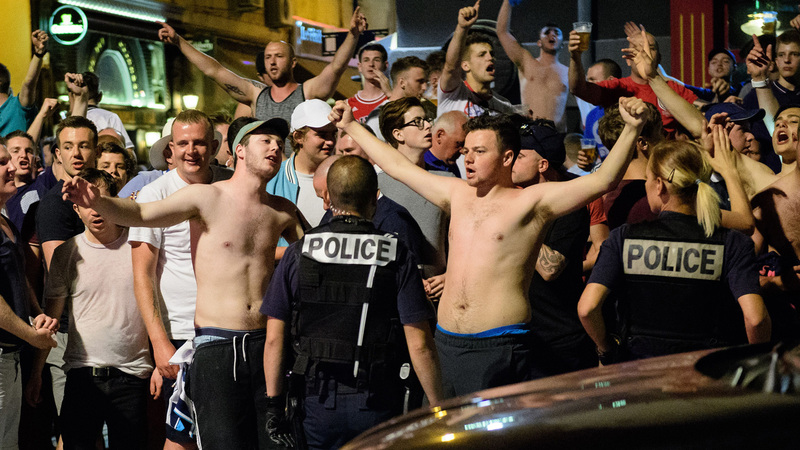 Two people were detained and four police officers lightly injured in violence overnight in the southern French city of Marseille involving England supporters. Trouble flared overnight in the southern French city of Marseille, where soccer supporters from England and Russia are gathering for a European Championship game on Saturday. Witnesses said the fight, outside a pub in the Mediterranean city’s Old Port district, was quickly handled by police, who used tear gas to restore calm. Local youths were apparently involved in the trouble, along with English fans drinking in the pub. Riot police with shields separated the two groups. Ambulances were seen arriving just after midnight. It was not known if anyone was injured. Police said two people were arrested. England fans were involved in violent clashes with locals in Marseille during the World Cup in 1998. French Interior Ministry spokesman Pierre-Henry Brandet said the government will ensure extra security around Marseille fan areas tonight and tomorrow.